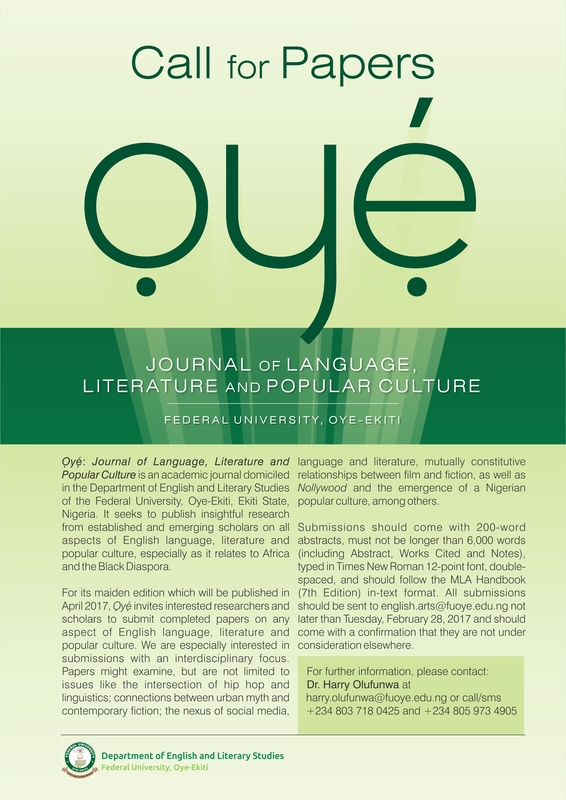 Ọyẹ: Journal of Language, Literature and Popular Culture is an academic journal domiciled in the Department of English and Literary Studies of the Federal University, Oye-Ekiti, Ekiti State, Nigeria. It seeks to publish insightful research from established and emerging scholars on all aspects of English language, literature and popular culture, especially as it relates to Africa and the Black Diaspora. For its maiden edition which will be published in April 2017, Ọyẹ invites interested researchers and scholars to submit completed papers on any aspect of English language, literature and popular culture. and the emergence of a Nigerian popular culture, among others. Submissions should come with 200-word abstracts, must not be longer than 6,000 words (including Abstract, Works Cited and Notes), typed in Times New Roman 12-point font, double-spaced, and should follow the MLA Handbook (7th Edition) in-text format. All submissions should be sent to english.arts@fuoye.edu.ng not later than Tuesday, February 28, 2017, and should come with a confirmation that they are not under consideration elsewhere. For further information, please contact Dr. Harry Olufunwa at harry.olufunwa@fuoye.edu.ng, or call/sms 234-8037180425 and 234-8059734905.